Dogs, helicopters and cowboys on horses herd cattle, and now a robot can help with the roundup. Called SwagBot, the ungainly looking prototype has four metal legs with rubber wheels, topped with a rectangular silver box containing a battery pack. SwagBot is named after the “swagman,” an Australian term meaning someone who travels from farm to farm for work. But this one is electric. 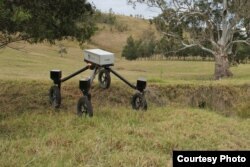 The robot, with its waterproof chassis, was tried out on the rough terrain of an Australian cattle station, making it over logs and ditches and through swamps. The cattle ran in front of the robot as it advanced. The scientists at the University of Sydney who developed SwagBot hope cattle, sheep and other animals will figure out what the robot wants them to do. The SwagBot, ready to herd some cattle. The vast Australian cattle stations are often difficult to access. Located in remote dry areas where the vegetation is sparse, a large amount of land is needed to support the livestock. And that’s where the remotely controlled, all-wheel drive machine comes in handy. It can zip along up to 20 kilometers per hour on flat land. It can even tow heavy trailers. SwagBot is still a work in progress. Right now it uses a camera to see the animals, but the researchers are planning to put sensors on it, so instead of relying on periodic checkups from humans, the farmers can monitor the condition of their cattle electronically... especially animals that might be sick or injured, explained Sukkarieh, by determining their body temperature or the way they walk. There also are plans to enable SwagBot to monitor pasture conditions to find out where the grass is most plentiful for the cattle to eat. And, perhaps in areas where crops are being grown, even pulling weeds. The scientists hope SwagBot will be available to the farmers within three years, which means the cattle dog could be replaced by a cattle robot.